This CellML version of the model has been checked in COR and OpenCell and the model runs to replicate the results in the original published paper. The units have been checked and they are consistent. Please note that equation 2 on page 3604 of the paper defining the cell size is not included in this CellML description. ABSTRACT: We have developed a generic mathematical model of a cell cycle signaling network in higher eukaryotes that can be used to simulate both the G1/S and G2/M transitions. In our model, the positive feedback facilitated by CDC25 and wee1 causes bistability in cyclin-dependent kinase activity, whereas the negative feedback facilitated by SKP2 or anaphase-promoting-complex turns this bistable behavior into limit cycle behavior. The cell cycle checkpoint is a Hopf bifurcation point. These behaviors are coordinated by growth and division to maintain normal cell cycle and size homeostasis. This model successfully reproduces sizer, timer, and the restriction point features of the eukaryotic cell cycle, in addition to other experimental findings. 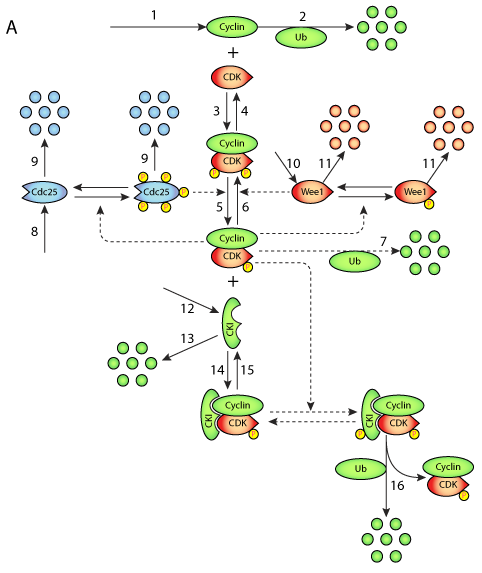 Signaling networks for cyclin and CDK regulation. Derived from workspace Qu, Maclellan, Weiss, 2003 at changeset 48e4f83ba03d.